"The table was a large one, but the three were all crowded at one corner of it." In 1907, Lewis Carroll’s Alice’s Adventures in Wonderland entered the public domain, spurring multiple illustrated editions to be released. Arthur Rackham’s illustrations are considered to be the most memorable of the early 1900s, but also the most controversial. Many people of the time considered John Tenniel’s illustrations for the story to be canon, and Rackham’s work deviated greatly from Tenniel’s style. 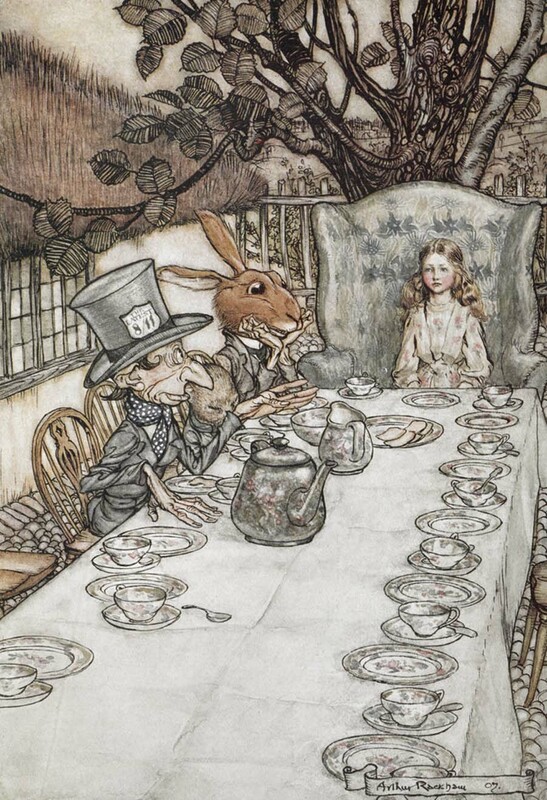 Despite this controversy, the overwhelming response was positive, and Rackham was lauded for his ability to bring Alice and the inhabitants of Wonderland to life. The table was a large one, but the three were all crowded at one corner of it. “No room! No room!” they cried out when they saw Alice coming. “There’s plenty of room!” said Alice indignantly, and she sat down in a large arm-chair at one end of the table.